AMSTERDAM, 06-Sep-2018 — /EPR INTERNET NEWS/ — European companies that have deployed Customer Data Platforms are highly satisfied with their systems, according to a study released today by the CDP Institute Europe (CDPIE). The survey found that the CDP was delivering “significant value” for 80% of CDPIE members who had completed a deployment. 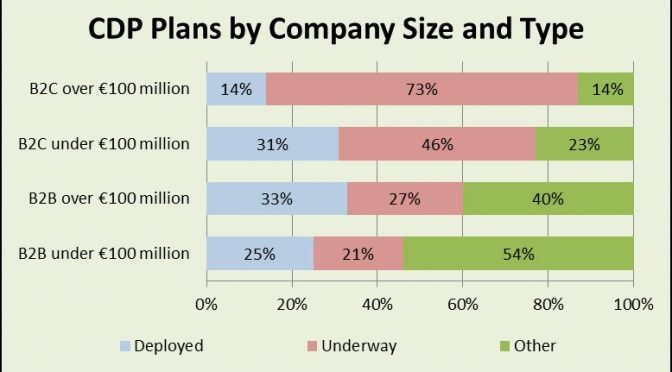 In total, 24% reported a CDP in place, another 34% had a deployment in process or planned within the next twelve months, and the balance had plans to deploy after the next twelve months, no plans to deploy, or didn’t know. large consumer companies (over €100 million revenue) have a much more pressing need for CDPs, with 68% saying they had many disconnected marketing systems. This group is the core of the CDP marketplace worldwide. Only 26% of business-to-business companies have many disconnected systems. large consumer companies are more likely to connect their systems with a CDP. A total of 86% had a CDP in place or were planning a deployment. By contrast, 52% of business marketers had no CDP deployment plans, reflecting the greater existing integration those groups reported. Interest in CDPs extends well beyond marketing departments. Marketers accounted for just 40% of respondents at B2C companies, with IT (23%) and corporate management (17%) also heavily represented. Over-all, CDP deployment in Europe is in early stages. Only 14% of CDPIE members at large consumer companies had completed their CDP deployment. 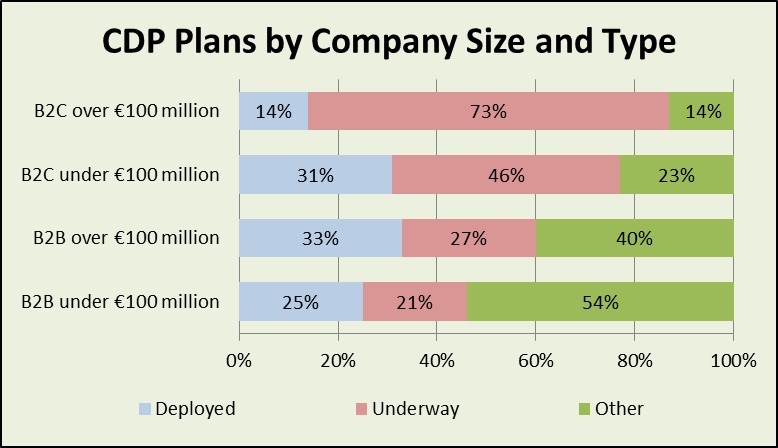 We believe deployment rates are substantially lower among non-CDPIE members. Customer Data Platforms are packaged software that builds a unified customer database which can be shared with other systems. The CDP Institute estimates that European revenue for all CDP vendors will total at least €200 million in 2018, including €130 million for EU-based vendors, and is growing above 50% per year. For details, see the CDP Institute’s CDP Industry in Europe Report and worldwide CDP Industry Update, both published in July 2018.